Circle your calendars on September 8 – 9 for the 3rd Annual Free the Snake Flotilla! This family-friendly event will feature two nights of camping at Chief Timothy Park in Clarkston, WA., along with guest speakers, live music, food and a paddle into the lower Snake River canyon. Please join hundreds of activists from around the Pacific Northwest to advocate for the removal of the deadbeat four lower Snake River dams! Register here. Festivities begin at 5:00 pm at Chief Timothy Park on Friday, September 8. Along with inspirational speakers, there will be music by Spokane-based Folkinception. If you plan to camp with us Friday and/or Saturday, a donation will be collected by volunteers at the park entrance. Suggested donation is $10 per tent and $20 per RV per night. Please bring food to eat on Friday night. Activities begin at 8:00 am at the Chief Timothy Park boat launch on Saturday, September 9. There will be parking lot volunteers to direct traffic and facilitate unloading watercraft. Look for the flotilla registration table to sign waivers. Coffee and light breakfast foods will be provided. A flotilla logistics and water safety team talk will follow before the 10:00 am boat launch. If you would like to serve on the volunteer water safety team or the volunteer land logistics team please indicate while registering. Kayaks, canoes, SUP’s and other water vessels are welcomed on the water. Since this is a reservoir, however, give second thought to bringing a raft! If you need to rent a boat visit the flotilla website. Please bring a life jacket, water, snacks, extra clothes and your personal sign or banner advocating for the return of a free-flowing lower Snake River! After returning to the park at 3:00 pm, we will eat a late lunch and relax. If you are camping, this will also be a good time to set up your tent. Live music will follow by the Spokane-based Smackout Pack and Atlas Hugged. 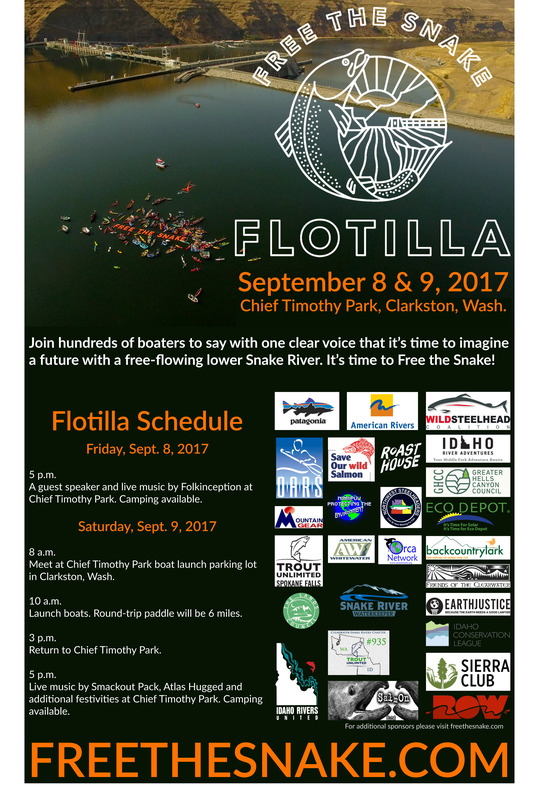 Please don’t forget to register for the 3rd Annual Free the Snake Flotilla on September 8 – 9 at Chief Timothy Park in Clarkston, WA. If you are willing to volunteer at the event, please indicate while filling out the registration form. It’s time to breach the four outdated, low-value, deadbeat dams on the lower Snake River. It’s time to free the Snake!